You beat us to a thank you e-mail :) We can't stop smiling about how wonderful these last few days were, and your work and energy was a huge part of that. So many people came up to us and our families and said over and over again how great you all and the music was, and how everything came together perfectly. We couldn't have asked for a more packed dance floor and more fun party! We loved getting to work with you and thank you again for being such an important part of our memorable wedding weekend. We'll certainly be sharing your information with others and will keep you in mind for any future events. Thank you so much for everything. The wedding was amazing, and I can't tell you how awesome Gino and crew were. He did everything and way more than we could have asked for, and he absolutely made the party happen. I can't speak highly enough of DJUSA throughout the entire process, and I just want to thank you and your team for everything. I wanted to take some time out and thank you for being so easy to work with! Your team did a flawless job on Saturday night and always kept the dance floor packed. We will be sure to refer you and your team to our future clients and hopefully we have the opportunity to work together again in the near future! It has been a pleasure to meet you all. I must mention that Arjun was brilliant, understanding, and efficient. His work was highly commendable. We have hired a couple of DJs, but this event had the best. Surely, you will always be with us. It was an amazing night and Juicy did a perfect job! Us and the guests absolutely loved the set he played and the sax musician got a lot of compliments too! If I may ask, is there any way we can get a list of some of The songs he played? Guests are raving about him and wondering which 90s hip hop and rap songs he played haha and I can’t figure out which ones they were either. DJ Sharad was the DJ for our wedding on June 24th, 2016 and he was AMAZING! 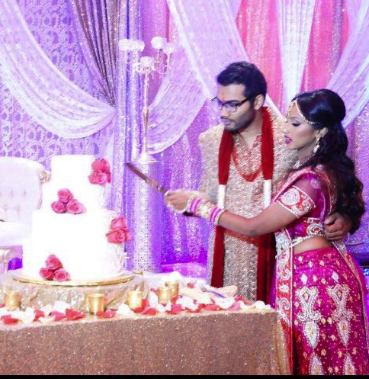 DJ Sharad & Avi helped me throughout every step of the planning process. Even in the busiest time, they would politely remind me of what they still needed from me so my event would run smoothly. It was nice to know that someone was there on the vendors end to help take some of the stress off of me. There was a slight mix-up with the photo booth that I had ordered. DJ Sharad apologized to me in person, and then did everything he could (inlcuding taking it apart) to make sure that I was satisfied with what was delivered. Everyone seemed to love the photo booth, as well as the music at the reception! DJ Sharad made sure to ask questions to get to know his clients and it definitely paid off! Every song he played made me and my guests want to get on the dance floor! It makes me happy to know that we weren't just clients, or just another Friday night to him and the whole DJUSA team. I am beyond happy that I chose DJUSA for my wedding/reception! Thank you again, and ill keep sending more people your way! Thank you to the DJ USA team for helping our event go off without a hitch and for giving us the best reception we could ask for! The lighting was amazing, and we loved the LED DJ booth - thank you for that surprise add on! Karan\'s music was completely on point throughout the wedding and reception, and everyone had an amazing time dancing. Last but not least, Marco was absolutely incredible with getting the crowd hyped up during the reception. Leading up to the event, from the time we first contacted you for our wedding and reception, the entire team has been professional, friendly, and responsive. As I told Karan before the reception, once we hired DJ USA, we didn\'t have to worry about the team not pulling through, and that was a real luxury for us leading up to this weekend. Thank you again, and we can\'t wait for the next time we get to rock with you!! Hope you're doing well! I wanted to say a huge thank you for the amazing job DJUSA did at our wedding at the Hyatt Jersey City on June 17-18. I can\'t tell you how many people told me the music was the best they\'ve heard at a wedding and Saumil and I couldn\'t be happier. On another note, my brother Anuj (copied here) is getting married next year in CT and would like to use DJUSA as well. Could you give him a quote or put him in touch with someone who can? It would be for wedding and reception on July 2nd and possibly a Sangeet the day before on July 1st. The evening was wonderful - DJ Juicy totally killed it. I can't believe what a great job he did reading our crowd. People had the time of their lives - ourselves included. Can't thank you guys enough! Arun (Juicy) - you really gave all of us a night to remember! Can you believe how much our friends loved dancing to all the Punjabi beats?!! So fun! I first attended a DJUSA wedding in August of 2012. I knew then that when I got married I would need to have DJUSA at my reception. My fianc� attended a DJUSA wedding in August of 2015. I remember him turning to me and commenting on how phenomenal both the DJ and emcee were. When we got engaged in October, DJUSA was one of our first calls. From the very beginning, everyone we spoke to was informative, friendly and professional. Sharad went out of his way to meet with us on a Sunday morning due to the fact that my fianc� and I live in Boston. After we signed our contract, Avi was frequently in touch with me. This was especially helpful because I am frequently scatterbrained and forgetful! The day of the wedding we had to make some last minute changes and Avi was nothing but understanding and accommodating. From the second the reception started to the final notes of the last song, DJUSA was absolutely perfect! I\\\'ve had multiple friends and families compliment me on both the emcee (Marco) and the DJ (Avi) and the great party they threw. The music suited my fianc� and I perfectly, Marco made sure the party never stopped, and I can\\\'t wait to recommend DJUSA to my friends and families in the future! Thank you again for making our dream wedding a reality! Just wanted to say thank you for being a part of the most memorable day of our lives! We received so many compliments that the music was on point all night and people said they've never danced this much. The dance floor was packed all night and guests said it was the best wedding they've ever been to. Thank you so much for being patient with us and for working so closely with us to make everything run smoothly. Thanks to Max and Ashish and the rest of the DJ USA team! They had both left by the time I was able to get to them at the end of the night but I left a tip with one of the other team memebers, not sure of his name. Please let me know if there is anything else I can do for you. Thank you again to DJ USA for making our day the most perfect memory! You and your crew were beyond amazing! You made this event so easy for us with all that you did! By reading the crowd and playing music accordingly, picking up on my mess ups and just going with it perfectly and playing the right music, and even MC ing for me when I needed help. I couldn\\\'t have chosen anyone better to do it. You made this once in a lifetime event for my family that more memorable and I cant thank you enough for that!!! I must say DJUSA as a company is amazing, however these two guys are just extraordinary!! Amazing amazing amazing. Thank you for checking up on us every few minutes, thank you for being so well organized, thank you for being so punctual and early, thank you for your professionalism, thank you for your being exceptional, understanding, and most of all on point! You guys rocked and there's no doubt y'all are the best of the best! So thank you for everything, we love you guys!! Sharad, Manu, Rohit: You guys are the best behind the scene staff I've ever seen! Top notch! Avi thank you my brother for being one of the best Djs out there! Huge thank you for making Friday the success that it was. Juicy, you killed it. Looking forward to working with you guys in the future. Thank you for your kind e-mail. DJUSA made the night epic. They surpassed our expectations beyond our imagination. DJ Juicy and MC Max brought a lot of energy and were simply amazing. You have all been on point and extremely professional from the first interactions. Thank you Rohit, Arjun, Arun, Max, and Sharad. We know we will be working together again, so I look forward to seeing you then!